The shutdown deadline is just two days away, and while it looks like Congress will temporarily stave off the disaster of an appropriations lapse, agencies are not taking any chances. The Office of Management and Budget has released federal entities' shutdown contingency plans, which detail which programs and offices that would remain functional, as well as which employees would be forced to work without immediate pay and which would receive furlough notices. The plans were initially compiled in August, per OMB guidance requiring new contingency plans every other year. The first deadline for that new obligation passed at the end of last month, but agencies have updated their plans in recent weeks and OMB just made them public. In the 2013 shutdown, the Obama administration has estimated it originally furloughed about 850,000 employees. That number was reduced dramatically in the first week of the 16 days agencies were forced to close, as the Defense Department recalled nearly all of its 400,000 furloughed civilians. 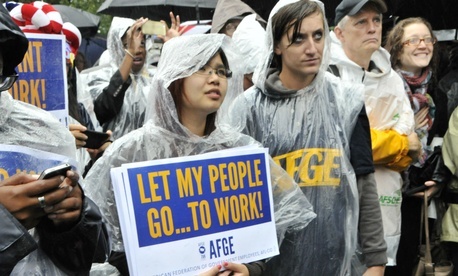 Agencies can retain employees during an appropriations lapse for several reasons, including: the employees’ salaries are funded by non-annual appropriations, for example through collected fees or multi-year funding from Congress; the employees' work protects life or property; the employees are necessary for an “orderly termination” of agency functions; or the employees are essential in supporting otherwise excepted functions or employees, such as those who protect life or property. 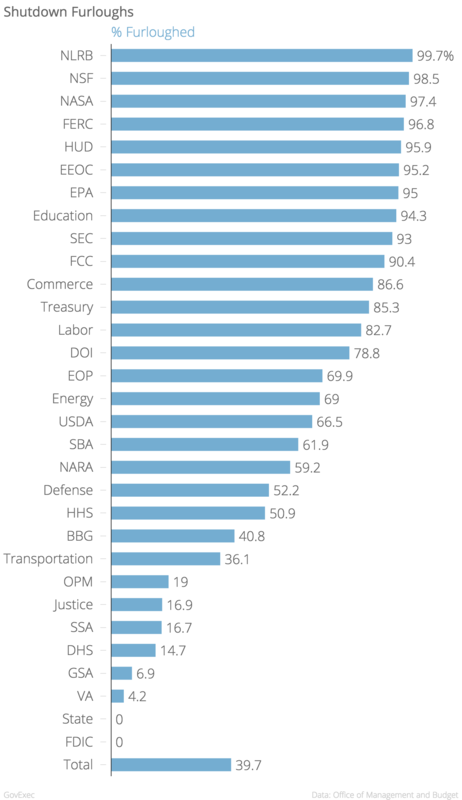 Below is a chart of the percentage of each large agency’s workforce facing furloughs. While those required to report to work during a shutdown are guaranteed back pay once the government reopens, furloughed workers are not -- though Congress historically always granted their salaries retroactively. All told, more than 860,000 federal workers would be furloughed if the government shuts down on Oct. 1, while about 1.3 million would have to show up to their jobs with only the promise of delayed pay. The National Labor Relations Board would fare worse than any large agency in the event of a shutdown, sending home all but five -- or 99.7 percent -- of its 1,600 employees. The U.S. Geological Survey, a component of the Interior Department, would also furlough more than 99 percent of its 8,000 workers. A couple notes on the above chart: The Defense Department has not yet detailed exactly how many of its civilians it would furlough. A spokesman told Government Executive the “vast majority” would be furloughed, but for the sake of this estimate, the 400,000 figure from 2013 was used. While the Pentagon eventually recalled most of its furloughed civilians, it only did so under its interpretation of a law passed by Congress just before funding expired called the Pay Our Military Act. Congress has yet to pass any such legislation this year. Additionally, the State Department has not issued an estimate of its furloughs, and while it would be more than zero, the department has said in the past that only a “small number” of employees would be sent home. The Energy Department also did not provide specific numbers, so an estimate based on the 2013 shutdown was used. As was apparent during the last shutdown, these numbers are not set in stone and can fluctuate based on emergency situations or the length of the funding lapse. For example, the Commerce Department has noted all 12,000 Patent and Trademark Office workers would be exempt during a shutdown and would report to work. If the government remained closed for more than four weeks, however, existing funds would dry up and furloughs would start. The Federal Deposit Insurance Corporation would face a similar situation. The Federal Emergency Management Agency in 2013 recalled some employees to deal with an anticipated tropical storm. While congressional leadership has promised a “clean” stopgap funding bill to avoid a shutdown this week, agencies will likely once again be faced with a looming budgetary crisis in mid-December. At least they will have their contingency plans ready.